The Heath Post: What's On TV Tonight (1969)? 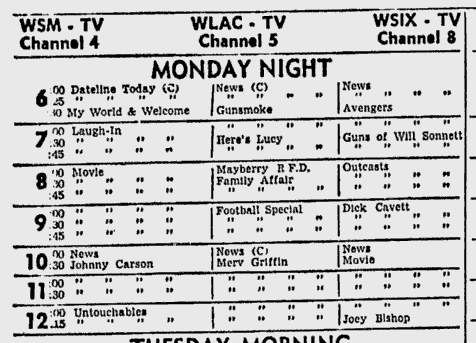 What's On TV Tonight (1969)? NBC's going all out to claim the Hoptown market in this new 1969-70 TV season. 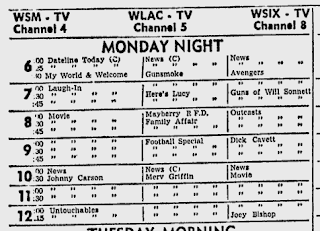 That's an ad that Nashville's WSM Channel 4 placed in today 1969's Kentucky New Era, and it appears we'll get one of these day this week as NBC tries to get a jump on ABC and CBS this fall. Cynthia Lowry of the AP, who is a really good writer, wrote, "When the program concentrated on the husband's attitude toward his wife, on the wife's handling of her husband and on the daughter's management of both, it was witty, urbane comedy. It got into trouble, however, with a sharp shift of style and mood in visualizing the hero's flights of fancy. Then the comedy became broad, restarted to commonplace gambits and used a loud laugh track to destroy the delicate fabric it had woven." I'll give it a whirl. But I'm switching to CBS in time to see Lucy. "Fidelity is alive in many parts of Connecticut" really is a pretty funny line. More good Cynthia Lowry, on The Bold Ones: "E.G. Marshall played the head of an ultra modern hospital with crisp authority. John Saxon and David Hartman are, respectively, the head surgeon and chief of medicine, and were properly dedicated and tense." And of The Bill Cosby Show: "It is a pleasant show, designed for chuckles rather than loud screams." I'm going to try to exude crisp authority the rest of the afternoon. I've never been able to exude crisp authority. No, it didn't work for me either. I tried yesterday, but I still got dominated by the checkout person at a Chinese-food place in the Newark airport. 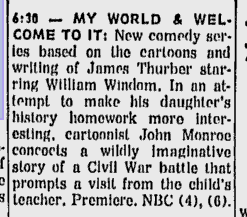 I'm a big fan of James Thurber, but I don't think his work is well-suited for a mass audience. I thought that show had some real promise, but American culture doesn't have much sympathy for the inner life of husbands. And in any event, you can always watch "The Seven-Year Itch," which covers this same story.